A powerful beat-making tool with functionality and sound quality way beyond its low price point. Intuitive, compact and well built. Software works without the controller. Solid sounds with real-time X/Y touchpad. No dedicated MIDI I/O ports. The latest version of Spark, named SparkLE, utilises version 1.6 of Arturia's Spark Creative Software. It houses a powerful sound engine fusing analogue and physical modeling with samples of electronic kits, acoustic drums and user sample import capability to a step sequencer driven by eight velocity/ pressure sensitive pads. Said pads have 64 writeable patterns each with 64 steps available over four banks that can be chained to form arrangements in a similar way to an MPC or Maschine. "The sound engine and functionality is retained from the original Spark software but the hardware controller has been stripped down"
Thankfully, the sound engine and functionality is retained from the original Spark software but the hardware controller has been stripped down, aimed at travelling producers, live performers and those low on studio space. When using the software there's the option of using the original and more complex Spark controller skin, or the new and simpler SparkLE version. The biggest downside is that the dedicated MIDI in and out ports have gone, along with the 27 real-time controller knobs, making the SparkLE controller less capable when controlling the Spark software and as a generic MIDI controller. Even though this means you lean on your computer screen a little more, it doesn't feel like it has lost too much compared to the original Spark and the overall workflow is still fast and intuitive. Notably, the software is stable with no crashes occurring during the review period. "We love how the controller doesn't have to be connected to use the software"
Like Native instruments Maschine, we love how the controller doesn't have to be connected to use the software. That means, if you're on the move there's no need to bring the controller along if you don't want to. 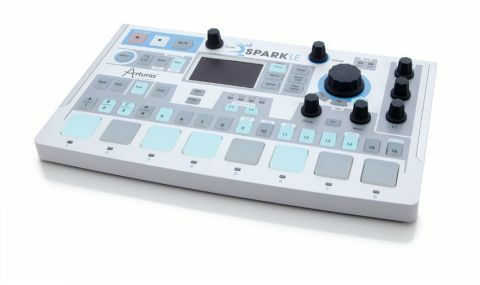 This is a significant advantage over the Akai MPC Studio, though SparkLE is designed to be more of a dedicated drum synth and thus doesn't offer the deep sample manipulating and chopping facilities the Akai has. That said, you can layer up to six .wav samples on a pad (with several trigger modes) but any sample chopping will have to be done in other software before importing. The neat looking USB powered sparkLE controller has been logically laid out and mirrored exactly by the SparkLE software. It's a shame they missed the shuffle (swing control) off the hardware but the swing itself feels great. Made of tough textured white plastic with a metal bottom, the controller is well made and we actually prefer its compactness to the original. The dials are made of an inviting, soft touch plastic and feel as though they will stand up well to plenty of abuse. The buttons and eight square trigger pads are made of translucent rubber, feel good and are backlit just like the MPC studio and DSI Tempest. Overall, a feeling of quality flows throughout the SparkLE and it's important considering its low price point. To test the MIDI controller capabilities, we hooked up the SparkLE controller to Motu BPM via Logic in order to trigger BPM's sounds. This worked well and you can reassign the dials and pads to whatever MIDI functions you require using the MIDI Control Center application. You can also drag and drop MIDI info (and export audio) from SparkLE into your DAW and send it to other MIDI instruments. The only pain is that the initial set-up takes a while on a Mac, involving cabling in Logic's environment and the set-up of the IAC driver in Audio MIDI Set-up. "SparkLE ships with a decent array of sounds including samples of classic Linn and Roland Machines"
However, it's all detailed in the well-written manual. It's also worth noting that you can also use the software in standalone mode without having to use your DAW. SparkLE ships with a decent array of sounds including samples of classic Linn and Roland Machines, acoustic kits and more besides. The analogue and physical modelling engines sound authentic and offer up plenty of control over the important details of sounds including timbre, tone, envelopes and the tension of snares on a snare drum (for example). Plus, there are some very respectable sampled and modelled synths and effects onboard that increase the sonic scope nicely. Even without dragging in your own samples there's plenty to keep you occupied, but Arturia also offers expansion packs (some of which are free) specialising in different types of sounds (think vintage and dubstep) to keep things fresh. The quality of the included content is excellent throughout and most of the sounds sit well in tracks without much further processing. That said, there are plenty of excellent effects onboard and a simple mixer with effect sends/returns, panning and volume. Working with the SparkLE software and the new LE controller is a rewarding experience - it flows nicely and logically. There's seldom any head scratching to do, leaving you free to make beats. To do so, pick a kit, hit record and play live on the pads before going into the step window to tweak, edit and automate parameters. SparkLE truly comes to life when using the real-time effects triggered from the X/Y touchpad. Even though it's £1,000 less, the workflow and feel reminds us a lot of our DSI Tempest (that should speak volumes). SparkLE's sound is a little harder/digital as expected yet still nicely soulful. For this kind of money, SparkLE is a steal when you consider its deep programming and real-time capabilities, fast workflow, small learning curve and superb results. The only significant thing it lacks is deeper sample editing/ chopping, so if you're considering Maschine Mikro or the new MPC software, you should seriously think about SparkLE as a worthy alternative for your beat-making tasks.